SAPPORO, Japan, Sept. 5, 2014 – Javier Aguirre had a disappointing start to his reign as Japan manager after his side lost 2-0 to Uruguay at the Sapporo Dome on Friday. Japan gifted Uruguay a goal in each half – Edinson Cavani in the 34th minute and Abel Hernandez in the 71st minute – and struggled to create chances. Aguirre opted to play with Hiroshima’s Yusuke Minagawa up front and a back four of Yuto Nagatomo, Maya Yoshida, Tatsuya Sakai and Hiroki Sakai. Masato Morishige and Hajime Hosogai played in front of them, with Keisuke Honda, Shinji Okazaki and Sporting Lisbon’s Junya Tanaka providing the attacking impetus in midfield. Japan started brightly enough and were able to keep Uruguay in their half of the pitch for much of the first half. Okazaki had an early but weak shot, while Honda planted the first of a series of free-kicks in the Uruguay wall. In the 14th minute, Nicolas Lodeiro took a free-kick and Cristian Rodriguez had a free header but put his effort over the bar from 6 meters out. 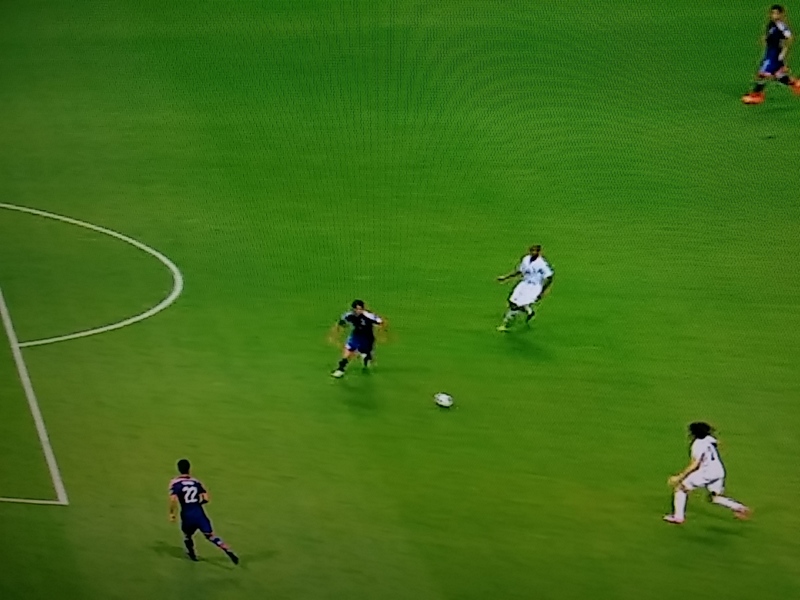 Okazaki responded with some dazzling work down the left to give Minagawa a similar chance, but the Sanfrecce Hiroshima striker also headed over. Japan came under pressure around the 25-minute mark and made a couple of very poor defensive headers, a sign of trouble to come as it turned out. In the 34th minute, Hiroki Sakai played the ball back to his namesake Tatsuya who had the simple job of controlling the ball and getting rid of it as two Uruguayans bore down on him. Unfortunately, he failed to cushion the ball and let it run to Cavani, who offloaded it to Diego Rolan. Cavani ran for the rebound before squeezing the ball past goalkeeper Eiji Kawashima and a desperate lunge of atonement from Sakai. Japan 0, Uruguay 1. To be fair, Japan had acquitted themselves decently up to that point and the game was open, perhaps even there to for the taking by whichever team showed a bit of drive and imagination. Tanaka was looking the most likely to do the job for Japan but he didn’t have enough strong support. Japan need to find another Yasuhito Endo, a player who can take the ball and distribute it with ease. Japan were also missing Makoto Hasebe in defensive midfield and while Morishige did a decent job, Hosogai still has to turn in a convincing performance for the national team. Tanaka’s last major contribution was a decent 25-meter shot that went straight to Uruguay keeper Fernando Muslera. He was replaced by Yoichiro Kakitani with about a quarter of an hour to go. Before that, Uruguay had gone 2-0 up. Hiroki Sakai, who had one of the first half’s dodgy headers, inexplicable headed a cross back into his own box. Kawashima made a great save from Lodeiro’s fierce shot but Tatsuya Sakai couldn’t clear the ball and Hernandez rushed in to fire it home from close range. Honda had time to fire his third crap free-kick into the Uruguay wall as Japan resorted to negative play and didn’t look like scoring. However, in a rare ray of hope, substitute Yoshinori Muto saw a lovely 25-meter volley bounce off the inside of the post in the 88th minute. Japan weren’t going to get any closer than that and will have to hope for better luck against Venezuela on Tuesday. This entry was posted on Friday, September 5th, 2014 at 10:44 pm. You can follow any responses to this entry through the RSS 2.0 feed. You can leave a response, or trackback from your own site.